The Minimal-Mess Permanent Indoor Coop! OK here it is..3 stock tanks and 2 flexible covers! The topmost cover can be used to cover one single tank (with the original "topmost" cover). They started out with one tank as babies and now moved to the 3-tank setup. Tank 1: That's their Restaurant Kitchen. Basic Food & Water. Tank 2: Forage & spa area. That's where I put their goodies, weeds, sod, and on half of it there's a layer of dirt. They take a lot of dust baths there. Between the tanks: Observation Deck. They can fly up and look out the window from there. 1. No construction of the basic coop! Just put the stock tanks next to each other. 2. Minimal mess! The birds cannot kick bedding and other stuff out onto the floor, as the sides are high. 3. Room with a view! The observation deck and interior coop lips are great places for the birds to watch the action in your house, or look out the window. 4. Great cleanability! Most surfaces are metal or plastic and can be wet-wiped or disinfected easily. 5. Comfortable space! I have 3 hens in this setup and they do not pick at each other since they are not crowded. 6. Tanks remain intact! Should you decide not to use the tanks in the future, you've got a great container with no holes that you can use for making a patio pond, or whatever you want! 1. 3 stock tanks: 2 that are 6'x2'x2'. 1 that is 4'x1'x18". 2. A 20' roll of black landscape edging. The kind with a LIP on the bottom. Right now Menard's doesn't have the right kind. I got the Professional version at Home Depot. You will need the lip in which to insert the bottom edge of the hardware cloth (wire). 3. Lots and lots of buffalo (zip) ties. 4. Hardware cloth (wire mesh), 1/2" x 4'. 1 large roll should do it. 5. PEX tubing. There is terra cotta or blue. I got terra cotta. 6. Scrap wood for making the cover supports and ladders. 7. Vinyl garage threshhold material, with lip, 11' long if you can get it (the longer the better, all in one piece). 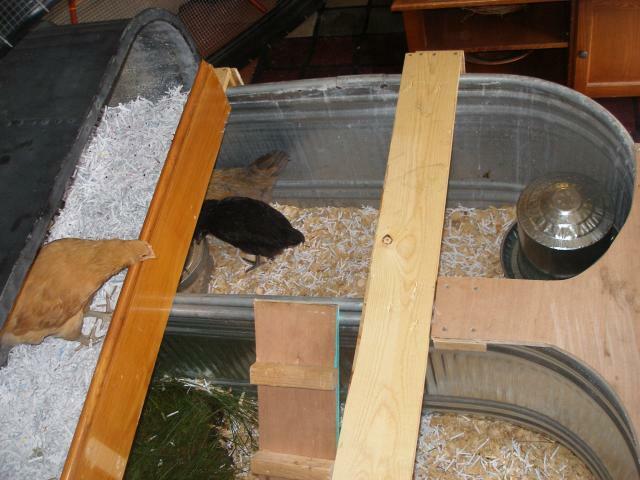 Steps to making the coop: My fiance did all the woodwork so I am describing this as best as possible. 2. Make 1 support to go across the tanks at end, with a lip on the outside for the cover. Make parts that hang down on the inside of the tank for stability. NOTE: You can use all supports, but really, the coop functions really well with only the transverse support under the top tank, and the observation deck support. 3. Make a wooden piece to go under the bed/nest area. If your stock tank has a top thin lip that sticks out like this one does, you can make a groove in the wood platform under it so that it stays better. Make a partial front cover to go across the top tank, so the birds can perch on it at night if desired, and it also keeps the bedding in. 4. Now that the cover supports are made, you are ready to make the main cover. Get yourself into a big area where you can spread out. Have 2 people for this job, as the materials are large and unwieldy. Place your hardware cloth into the lip of the landscape edging. Drill a hole every 6-8" or so and buffalo-tie the wire to the landscape edging. Cut off the excess tie material. Use the joiner piece to join the ends of the landscape edging together. 5. Set up your tanks and the cover supports. Put the main cover on the supports. Now you are ready to install the Pex tubing for stability. Make an "x" pattern with the tubing as you see in the picture. Buffalo-tie it and cut off excess tie material. Now you have a frame under which to bend the remaining wire cover material. Bend the hardware cloth so you end up with rounded corners, buffalo-tying as you go. You'll end up with a small open space at the top. 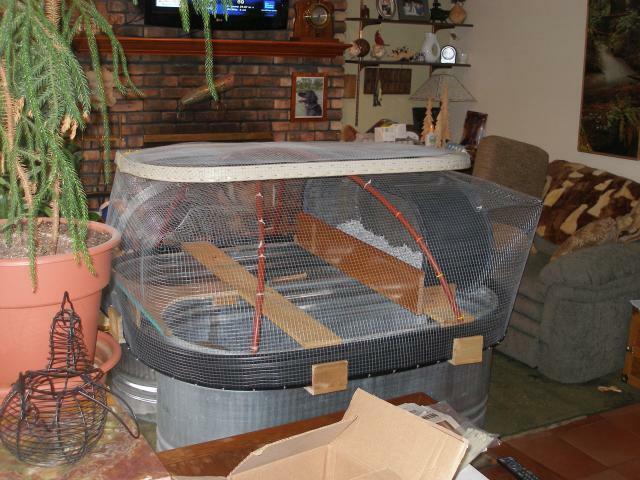 My girls have not been able to fly out of the top, but I use their brooder cover when I am away from home, just to be sure. 6. 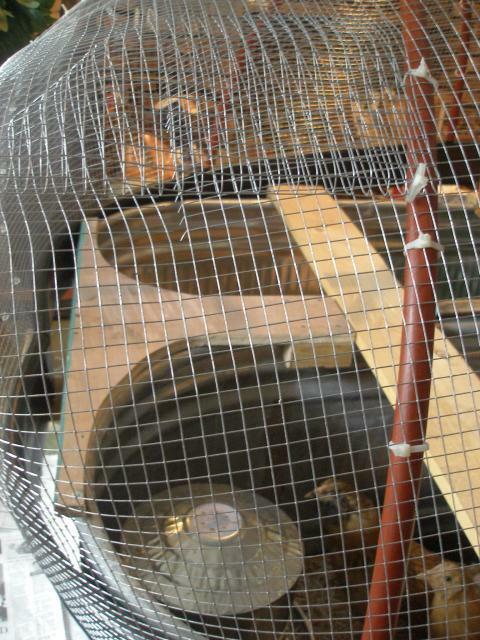 Optional: Making the brooder/top cover: Take the vinyl garage threshhold material and bend it around the top of one of the big tanks. Fasten it together with a staple gun. Bend the wire over and around the tank and over the vinyl material. Cut the wire so that when bent, it hits the bottom of the vinyl material. You will be bending the lip up and fastening it all around with a staple gun. Use plenty of staples as the materials are wont to separate otherwise. The cover should fit somewhat tightly over one of the tanks, but not so tightly that it's hard to lift on and off when you are using it for only one tank. 7. Making the ladders. You are now ready to make means for the birds to get to different parts of the coop. Cut 2 pieces about 6" x 2-3' (depending on where you want to put the ladders). Fasten other pieces with screws, about every 3-4", for steps. I put one ladder up to the bed/nest area and one that leads up over to the other big tank. The second ladder is by the observation deck. 8. Congratulations! Now you are ready to put the goodies in. Basic bedding: Use pine shavings for smell-good. You can also use shredded paper--make your own, or see if you can find a bank/office that does not do its own shredding, and convince them to give you their discarded shreds. Do not be afraid to be DEEP with the bedding--it will be less maintenance. For the forage/spa tank: put topsoil/dirt in half of it. Cover the rest with pine shavings or shredded paper. Throw in weeds as you pick them. You can also put in a chunk of sod. The birds will mix it all up for you and make some pre-compost! Throw in dried corn cobs, worms, etc....the sky is the limit! Put their waterer and feeder in the non-forage/spa side. 9. Cleaning the coop: I use a big wastebasket and broom and a big dustpan. It takes probably an hour or so to clean the coop out. The used bedding goes on the compost pile. The observation deck and ladders might get poopy--take them outside or to the basement and hose them off. For people that have house chickens, this could be a solution to housing. Nicely done. Pictures of the build in progress to break up the instructions would have been awesome. yes... go with the diapers. btw... a chicken diaper can be as easy as a walmart bag tied around their back-end. I am so sorry you are having trouble with neighbors! You are such a good chicken parent trying what you can to make it work till you have a better situation. It looks like a great idea! Clearly it has been working, and it looks like more space than some people would give 3 hens. Great idea! I can tell ya just from raising chicks inside.. .this wont work. your whole home will be covered in dust! This would definitely work for a temporary 'outlaw' situation!! Did you look into poultry diapers? I know there are quite a few people who keep a few hens in their homes & use poultry diapers on them. I have no personal experience with this, but they swear by them! LoL!! Keep the fight on for keeping them legally!! How in the world can full sized chickens live in this? just one question........ Why would you hose off a poopy chicken stick in the basement?